I can’t remember the last day I lived like a vegetarian, but I started my basic work day with a bowl of cheerios and skim milk. I also brought clementines, grapes and bananas to work for healthy work week snacks. Once late morning rolled around, one of my bosses bought in chocolate goodie bags for us with a few lindt chocolates. Lunch ended up being those chocolates and a banana. For Valentine’s Day, our office turned the dining space into “Cupid’s Lounge”, which served champagne and a chocolate fountain complete with fruit, cake, and other treats. Later on, clementines filled the gap due to the sustenance void (protein). Once I got home, I decided to continue the trend and made another Asian vegetable dish with rice, only this time I added an egg for protein. Heat wok over high heat. Add oil and move around to coat the bottom and sides of the wok. Add egg and quickly stir with a large spoon/spatula/chopsticks. Once it’s finished, place in a separate bowl and set aside. Let wok reheat and then add stem pieces. Toss and let cook roughly 3 minutes. Add remaining Chinese broccoli and cook another 3 minutes or until ready to eat. Set aside in a separate bowl. In the wok, add soy sauce, oyster sauce, honey, and pepper. Let reduce roughly 1 minute or so over medium heat. 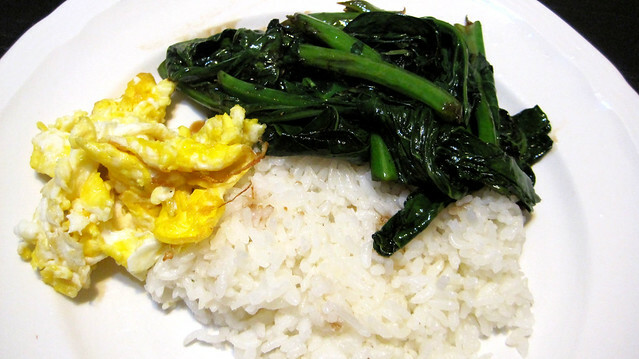 Add broccoli and egg back into wok toss to coat and serve with rice. I forgot to throw in the egg so so I just served it on the side.